SongWriter Camps is a place to take your songwriting skills to the next level. It's a fun, nurturing and inspirational camp to escape with a group of like-minded, creative people. Our mentors are a team of active hit songwriters and industry professionals who will share their experience and knowledge first hand. We want to help you navigate your way through the creative process and the business side of songwriting so you can get your songs out to the right people. Book your place now for our next upcoming camp. Places are limited so please apply early!! "Songwriting is one of my biggest passions in life. It is an honor and joy to mentor others and to pass on the knowledge, tips and techniques I've learned over the years. I am thrilled to be working with my friend and longtime collaborator Richard Harris". New Zealand born Pam Sheyne is a multi-platinum selling songwriter, producer, singer and mentor. Her songwriting career has achieved success on a global scale and includes international hit records and song placements in numerous films and TV shows. With 50+ million record sales, 100+ platinum sales, she is also a prestigious Ivor Novello Award winning songwriter. Pam is best known for co-writing the #1 Billboard hit "Genie In a Bottle" for Christina Aguilera. Her songs have been covered by a number of international artists including; Camila Cabello, Demi Lovato, Lindsay Lohan, Jessica Simpson, Corrine Bailey Rae, Seal, Sinead O’Connor, The Backstreet Boys, Cece Winans and The Saturdays. In the TV and film world, Pam has written end titles for The Princess Diaries, Confessions of A Teenage Drama Queen and Golden Globe nominated film, The Young Victoria. Pam’s songs have featured in TV films Camp Rock 1 & 2, Jump In and numerous TV shows. She also appeared as the songwriting mentor in the first series of BBC TV’s Fame Academy. "My goal is to educate, inspire, encourage and give hope to all that are walking this path". A mantra that Richard will be bringing to this new venture and partnership with Pam Sheyne at SongWriter Camps." Richard is a #1 Billboard songwriter, producer, artist and mentor. Transplanted from the UK over a decade ago to LA, Richard quickly signed a staff writer publishing deal with Peer Music landing multiple major label song cuts all around the world. With several #1's, top ten singles and platinum records he continues to have hits including a recent #1 Billboard dance single. Richard has landed hundreds of TV, Film and Ad song placements through Peer and the major music libraries he has composed for. Hit shows including "Empire", "Nashville", "Vanderpump Rules", "Cold Case", "One Tree Hill", movies "This Means War" and "Single Moms Club" and commercials for eBay and Vivo are among a few of the highlights. One of Richard's passions is mentoring. Over the years he has helped numerous artists and writers hone their craft and find success with their music. A young Meghan Trainor was one of the writers that Richard was able to help guide along the way up to the point of her signing her first publishing deal. "I have known Pam for as long as I have been a songwriter. She was one of the first people I ever co-wrote a song with. This is important to note, because at the time, she was the hottest writer on the planet. She had a massive smash on the radio with “Genie In A Bottle”. Still, she took the time to meet with me and ultimately invited me to write with her. I was a nobody just starting out and trying to find my way. What started then became a long and fruitful friendship and professional relationship. We have written loads of songs over the years. Some songs that to this day, are the ones I am most proud of in my career. I learned so much from Pam; how to never settle, how to keep pushing until the song is just right, and how to craft a lyric that not only means something, but is memorable and unique. I don’t think I would have had nearly the successful career I have enjoyed if I hadn’t met Pam Sheyne. She is truly a talent, a professional, and more than that, a loyal friend and colleague. If you should be so lucky as to get a chance to work with her, or be mentored by her, I would jump at the chance. I guarantee it will only make you a better artist, producer, songwriter, and person. " Adam Anders - Music producer and Writer - Jonas Bros, Miley Cyrus, Tori Kelly, Selena Gomez, BSB. Exec music producer on Glee and Rock of Ages. Pam is more than a great songwriter with a lot of gold in her catalogue. She is an artist’s best friend and a career architect for those who put their trust in her talent as a writer, producer and vocalist. 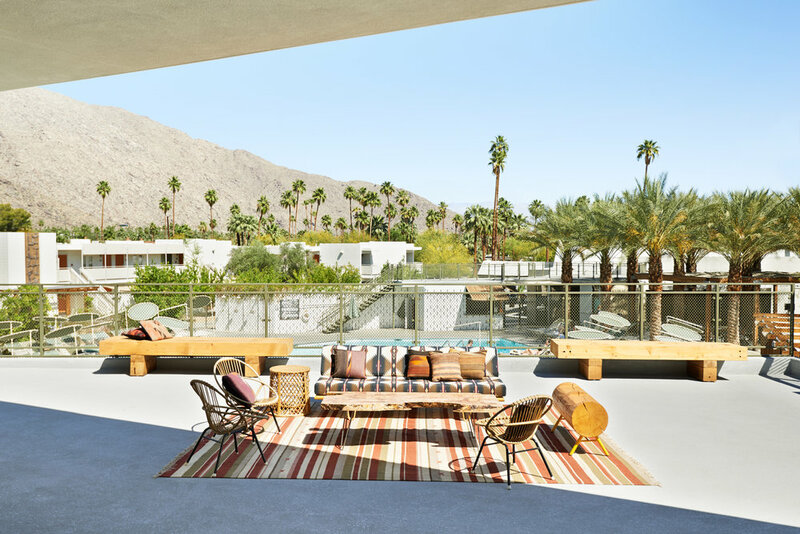 Set below the foothills of the magnificent Mount San Jacinto, our upcoming SongWriter Camp in May 2019, will be hosted at the hip Mid-Century, Ace Hotel in Palm Springs. 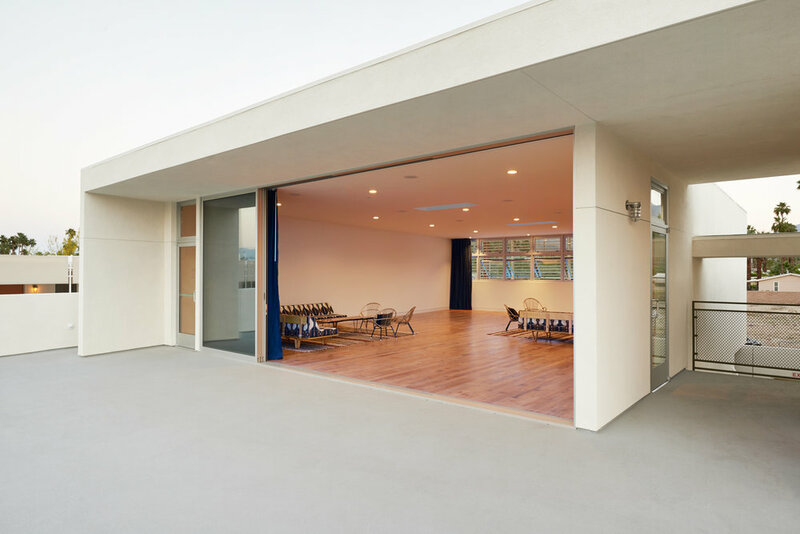 Just under 2 hour’s drive from LA, The Ace offers easy access, being less than a 10 minute drive from Palm Springs Airport and a 5 minute drive to and from Downtown Palm Springs. Our next camp is May 13th through 16th 2019! The camp runs over 4 days and 3 nights. The cost of the camp includes 3 night accommodation, resort fees, catering and the cost of the camp itself. Book by midnight January 31st to receive our early bird special pricing! We are proud to have the following companies sponsor our camps. All our attendees are being offered an amazing 75% discount off of Presonus' flag ship DAW, Studio One V4 Professional. That’s a $300 saving off the list price. This is the DAW that Richard Harris uses to produce, mix and master all his productions. Check out the Presonus website to read all about this groundbreaking DAW! This amazing songwriter tool has been used by both Pam and Richard for years since it first launched. Now in V3 Masterwriter have been kind enough to offer our attendee's a 1 month free trial and a very special discount off their first years subscription. We are currently receiving applications for the limited spots we have available at our next SongWriter Camps immersive. Please fill out the form below and include two of your best songs via links at Soundcloud, Youtube etc, and a short bio telling us about yourself and what you aim to get from the camp. We are excited to hear from you and will get back to you very soon! If you need to ask some questions or make any enquiries prior to sending us an application, just drop us an email and we will get back to you. Receive our updates by joining our mailing list!